This recipe is a great way to use up a lot of fish, feed a bunch of people and/or have some ready made meals in the freezer. Great for fish that has come close to its shelf life in the freezer, or the leftovers from smoking/grilling fish, which adds an awesome extra flavor. It really gets the most out of your haul, because you can use the portion of the fish that has bones in it. It's also really a crowd pleaser at parties. At this point I get yelled at for NOT bringing them to parties. 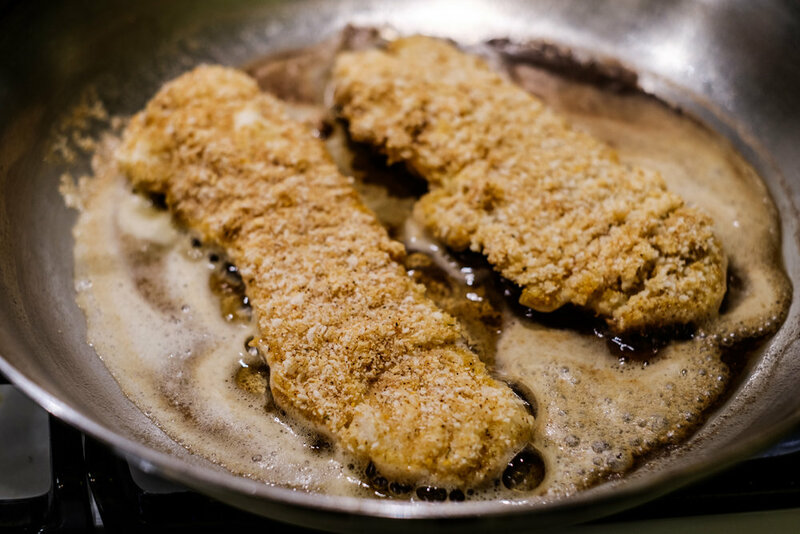 The thing that really makes a difference is using panko bread crumbs, and dipping them in egg whites before the bread crumbs, as they do for tempura in Japanese cuisine. It can take a few tries to get used to using the egg whites, but they really get the bread crumbs to stick and create a great texture. These freeze well, but I have learned to not let them defrost for too long, as they get really soft and deformed. I have a little Fry Daddy electric deep fryer that I use that has been with me since my days on the Ringling Brothers circus train, and even pre-dates my wife. That little fryer once set off the smoke alarm on the circus train and forced the entire train to a stop. Helpful hint: don't try and fry chicken on a moving train. Thanks to members of the Bayou Coast Kayak Fishing Club forum for the initial recipe and ideas. Fish (approximately 60/40 fish/potatoes by weight). Redfish, speckled trout, black drum, sheephead, etc are all great. Seasonings - personal preference, but I really like smoked paprika, black pepper, some hot pepper (I use my own), and maybe a little cumin. Put on good music, open a good beer. Start a pot of water boiling, add crab boil. The fish isn't in there for long, so add a healthy amount. Boil fish for about 5-10 minutes, until it just starts to flake and come apart. Pull it out with a slotted spoon and drain. Use the same boiling water to cook potatoes, saving some water/crab boil and time. Pull them out as soon as they are easily pierced with a fork. Do not overcook them, or you will end up with a paste. Drain and rinse them. They can get too spicy if you let them sit in the boil. Sauté the onions and garlic and butter. Don't overdo it with the onions, and make sure you really cook them up. They can overpower the fish if you use too much or leave them raw. Pick all bones out of the fish, get it flaked/crumbled up. Mix the fish and potatoes, stirring with a fork to mash the potatoes. Try not to over work the mixture so the potatoes don't get too creamy. As you mix, add some regular bread crumbs, and the egg yolks you separated. Add these ingredients a little bit at a time, as you find a good consistency that will allow for the mixture to be easily formed into golf ball size balls. If it feels too crumbly, add egg yolk, and if it's too soggy add bread crumbs. As you're doing this step, mix in your seasonings as well. Coax/cajole/wheedle/whine until you get your spouse, family member or friend to help you with the next step. Beat egg whites until quite frothy, but not forming peaks. Dip the balls (shut up), in the egg whites, then roll them around in a tupperware filled with the panko bread crumbs. I often add a little bit of seasoning and salt to the bread crumbs. Refrigerate for a little while if possible. Freeze whatever you aren't going to use. Deep fry those suckers and serve with hot sauce and remoulade. Sit back and enjoy the accolades and drinks that come your way. Try to convince that one guy that thinks he's tough to try the ghost pepper hot sauce. Optional - works great with blackened, smoked or grilled fish instead of the boiled fish, or a combination of both. Also works great as fish cakes rather than balls.